We have received notification of the recent death of Piper Alfred (‘Jeff’) Jeffrey who lived in Perth, Western Australia. Piper Jeffrey served with the 2nd Battalion in Italy and Austria from 1943 to 1946 and an excerpt of his memoirs were published in a recent Emerald. You can read a full version of Alfred’s memoirs by following this link created by George Willis. “In retrospect, we all went through tremendous experiences and emerged if not unscathed, then not too badly ‘scathed’. In view of the wonderful replies to my email, I have decided to remain in touch. This means that when I go, there will be no warning. You will simply stop getting replies from me. I should tell you that, although I was called Jeff for broadcast purposes, my name is really Alfred, and I prefer it to Jeff. That makes three of us named after the only English king ever to be called “the Great”. Thank you for The Emerald; I am looking forward to it. Many thanks to Sergeant Alfred Cook for sharing these photos that were taken while he was serving with 1st Battalion, London Irish Rifles during 1942 and 1943 in Iraq and Egypt. Read more about Alfred here. 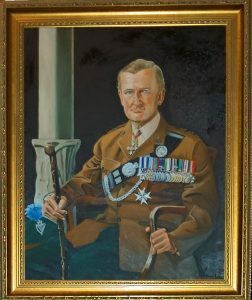 After passing the Army Examination, Corran Purdon entered the Royal Military College at Sandhurst in July 1939, and, following the outbreak of the Second World War, was commissioned into the Royal Ulster Rifles (RUR). His father had once said that “there’s only one regiment for the boy, the Royal Ulster Rifles” and so it came about that early in 1940, the young subaltern travelled to the RUR’s Regimental Depot, which was then located at Armagh. 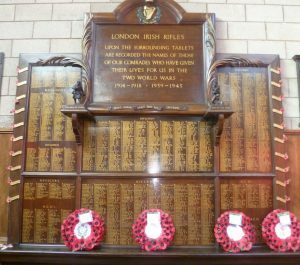 During the early period of the war, he would encounter a large number of men of all ranks from the London Irish Rifles, which was then part of the Corps of the Royal Ulster Rifles. After missing the chance to join the 2nd Battalion (2 RUR) in France in early 1940 due to his young age, Lieutenant Purdon volunteered to join 12 Commando who were forming in Northern Ireland. After more than a year of intensive training in various parts of the United Kingdom, in March 1942, he would take part in Operation CHARIOT, the commando raid on the Normandy dock at St Nazaire in German-occupied France, an important strategic asset for the German fleet in World War Two. The raid, which entailed ramming a ship, the Campbeltown, laden with explosives on a set timer into the dock, was a success but at the cost of 169 men killed and 215 captured. Having been wounded in the left leg and shoulder, Lieutenant Purdon was wounded and captured. He was a persistent escaper from a number of different POW camps, and so was sent OFLAG IV-C – Colditz Castle to which officers who persistently made escape attempts were transferred. When liberated by the Americans in April 1945, both he and another Rifles’ officer decided that they wanted to have “another crack” at the enemy, so they fought in the ranks with the American Army until VE Day. On his homecoming, Lieutenant Purdon had an initial desire to remain with the Commandos but would soon return to the Royal Ulster Rifles, then still part of the 6th Airborne Division, and was appointed Adjutant of the 1st Battalion (1 RUR), who were taking part in riot control and anti-terrorist operations in Palestine. On promotion, in early 1946, Captain Purdon was sent to command the Regimental Company at the Irish Group Infantry Training Centre at Omagh before spending two years as Adjutant of the 6th Battalion, Royal Ulster Rifles (TA), the first Territorial Battalion of the Regiment to be raised in Northern Ireland. In 1949, he was appointed as a Staff Captain at General Headquarters Middle East Land Forces located at Fayid on the Suez Canal, before being posted back to 1 RUR in Hong Kong as a Rifle Company Commander. In early 1952, Major Purdon was appointed Training Major for the 1st Bn London Irish Rifles TA at the Duke of York’s Headquarters. He described the Regiment as “full of characters” and later recalled that after his initial visit to the battalion he had noticed that “someone had attempted to boil an egg in my bowler hat! !” The Commanding Officer was Lieutenant Colonel John Cantopher and there were number of other well known figures present at the time, including Colonel Viscount Monty Stopford, Major Basil Irwin and Major Bill Brooks. In 1953, Major Purdon passed the entrance examination for entry into the Staff College and, after completing his time there, he took up a role as Deputy Assistant Adjutant General at the GHQ Far East Land Forces in Singapore. While working in the section dealing with terms and conditions of service and with the manpower of infantry battalions, he would regularly slip away from his desk to join officers, NCOs and men fighting the communist insurgency in the Malayan jungle. Before taking up his next role in command of the Regimental Depot at St Patrick’s Barracks in Ballymena, Major Purdon spent a few months again with 1 RUR, this time in Cyprus, taking part in operations against EOKA. After the depot, he was posted as Second-in-Command of 1 RUR in West Germany before taking over command in April 1962. The battalion returned home for a period in May 1963 before they travelled to South East Asia in early 1964 to undertake operations in Borneo where they confronted Indonesian armed incursions across the border of the Federation of Malaya. Following two years as a Chief Instructor at the All Arms Tactical Division of the School of Infantry at Warminster, in 1967, Brigadier Purdon took command of the Sultan’s Armed Forces in Oman, which over the next three years included taking part in operations in Dhofar and in the northern part of the country. On return to the UK in 1970, he became Commandant of the School of Warfare in Warminster. He was promoted to Major General in May 1972 and appointed as General Officer Commanding (GOC) North West District before being posted to Cyprus as the last GOC Near East Land Forces. On returning to the UK at the end of his army career, he became a commander of St John Ambulance and governor of the Royal Humane Society, before being appointed as Deputy Commissioner of the Royal Hong Kong Police Force from 1978 to 1981. The French government awarded Major General Purdon the Medaille d’Honeur de St Nazaire in 2000 and appointed him Chevalier de la Legion d’Honneur in 2005. Major General Purdon was appointed Honorary Colonel of the London Irish Rifles in 1986 and remarked that his great, great uncle Colonel James Ward had also been the Colonel Commandant of the Regiment at the end of the 19th century. 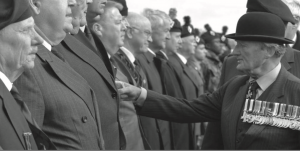 In 1994, he became President of the Regimental Association and would continue to be a regular inspecting officer at Association events for the past quarter of a century. General Corran’s close connections with the London Irish Rifles over so many years has been a constant treasurable pleasure for us all and it was always a privilege to meet him. Whether you were a member of D Company, the Regimental Association or the Army Cadet Force, he would always share a kindly word or generous piece of advice with everyone he met. The entire Regimental family would like to send their sincere condolences to all the family. Major-General C W B Purdon, CBE, MC, CPM. 4th May 1921 – 27th June 2018. ‘‘Corran William Brook Purdon, Oral History’, published by the Imperial War Museum in 1998. ‘List the Bugle: Reminiscences of an Irish Soldier’, published in 1993. 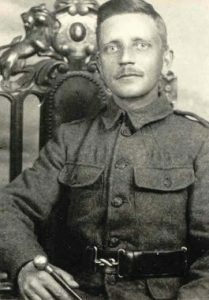 We recently received a note recently from Richard Berling about his grandfather Arthur, who was killed during September 1917. 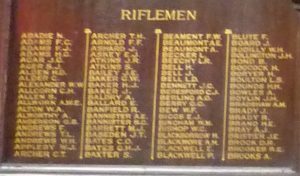 “My grandfather was listed as a rifleman who died whilst serving with the London Irish Rifles. He died on the 2nd September 1917 at Ypres and is buried at Mont Huon Military Cemetery. His regimental number was 6924 later 593990. Son of Andrew Berling, of 15, Albert Square, Clapham, London; husband of Dora Annie Berling, of 9, Rue Fontaine, Paris.